Mitt Romney is leading the field of potential Republican candidates in a recent national Quinnipiac University survey. While this might sounds impressive, it is important to recall that Mitt Romney faces long odds to being elected President in 2016. Since 1900, there have been twenty candidates from the two major parties who lost their first general election for the presidency. Of those twenty candidates, the vast majority decided to never seek the party nomination again – including the last seven losing presidential candidates of major parties (McCain, Kerry, Gore, Dole, Dukakis, Mondale and Ford). In the past 114 years, the only person who lost his first general election and later won the presidency was Richard Milhous Nixon. With these long odds in mind, it is useful to compare Nixon in 1968 versus Romney in 2016. 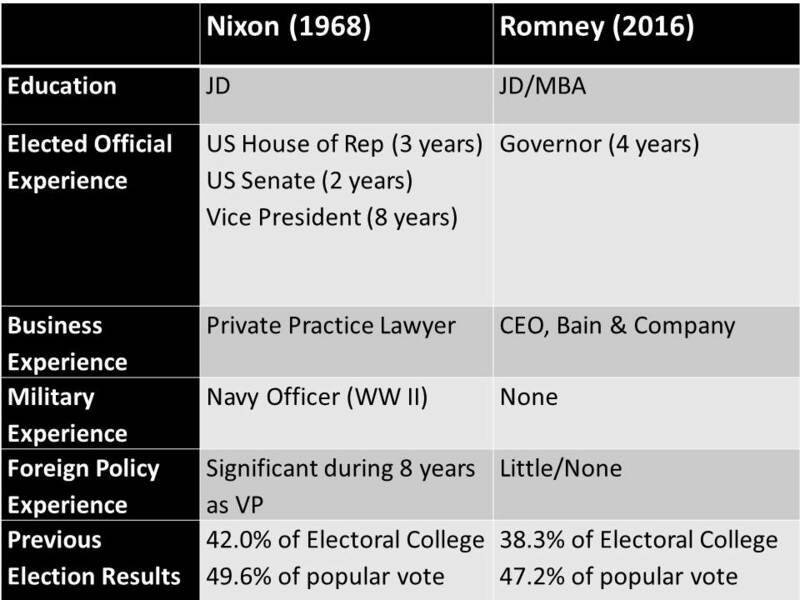 Nixon (1968) and Romney (2016) have some clear similarities including (1) the fact that both Republican candidates had lost in relatively close elections, (2) the Democrats had held the White House for the preceding eight years and (3) the Democrats lacked an incumbent (Obama ineligible in 2016, Johnson declined to run in 1968). As we can see in the Tale of the Tape below, there are some stark differences between Romney (in 2016) and Nixon (in 1968). Nixon in 1968 had roughly 15 years of experience at the national level of politics including 8 years as the Vice President with all of the foreign policy experience one expects from that background. Mitt Romney has been a one-term governor of Massachusetts, a much less extensive political background compared to Nixon in 1968. Romney also has little to no meaningful foreign policy experience outside of what would be gleaned in running the 2002 Salt Lake City Olympics, his business career and his 4 years as governor. Again, Romney falls far short of Nixon’s background in 1968. Lastly, while both ran competitive elections in their initial losing efforts, Nixon’s margin of loss in 1960 was narrower than the margin of loss for Romney in 2012. Of course, Mitt Romney would not be competing against Nixon. Rather, he would be running against a Republican field that so far lacks candidates with any way near Nixon’s level of experience as either an elected official in in the area of foreign policy. This suggests that Romney’s limitations as an elected official or in foreign affairs may not hinder him greatly in the primaries but these limitations could be targets for criticism in the general election. Will Romney jump through the hurdles of choosing to run, winning the Republican nomination and then winning the general election? History suggests that his chances are slim and that he may not be as well-positioned as Nixon was in 1968. Note: The historical irony in this Tale of the Tape is that Nixon’s main challenger for the Republican nomination in 1968 was George Romney, Mitt’s father. George Romney was criticized for his lack of foreign policy expertise.